Acer palmatum 'Osakazuki' has seven lobed foliage that is green in spring and summer, but in autumn it transforms into a blaze of fiery scarlet. Many believe 'Osakazuki' to have the most intense, long lasting scarlet autumn colour of all the Japanese Maples. Ideal for the smaller garden, yet still capable of creating autumn drama in a large garden, Acer palmatum 'Osakazuki' is a small tree or large shrub with an attractive open habit. Fairly fast growing as a young specimen, 'Osakazuki' settles down in maturity with an expected maximum height of roughly 4 x 3 metres in 20 years. Prefers a slightly sheltered position avoiding full sun where possible. 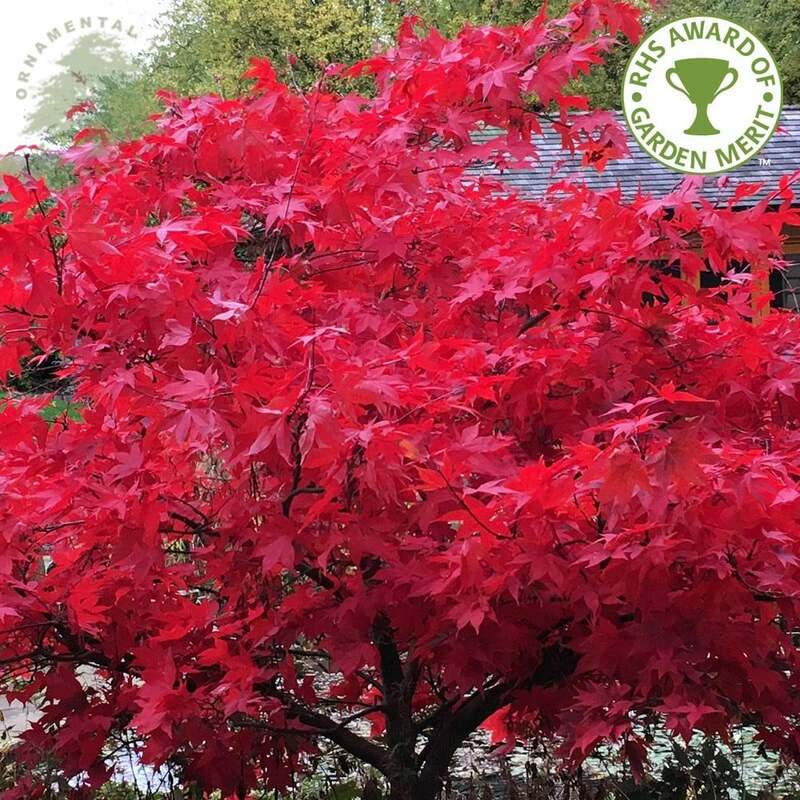 This award winning Japanese Maple is one of our top selling varieties, so we offer it in a range of sizes from quality young plants through to stunning semi mature specimen trees which are great value for the age of the tree. Pot grown 'Osakazuki' Japanese Maples can be planted at any time of the year. Firstly, remove all weeds and grass within a metre of your desired planting hole then dig a square hole as deep as your root mass and approximately 2x as wide. To help your tree establish more effectively, we advise sprinkling root grow in the hole, especially if you have poor soil.